Absolique Hair Health Clinic, Sydney – would like to thank all of our clients for your honest feedback, comments, stories, journeys and commitment to the Hair Loss Treatments recommended. Your continued dedication to your hair health is what delivers your results. Congratulations! I went to Absolique to get help as my hair was not growing and was very thin. I was explained everything in great detail, and helped with my decision to proceed with the rejuvenation of my hair. I have been on this process for less than a week and although it seems mind blowing to start off with, when you get into the rhythm it is not too bad, I am looking forward to a wonderful head of hair, and with Absolique by my side I am sure this is going to happen. Thanks to all. I am about to order and trial some products from Absolique. I will let you know my progress once I have tried them. The service I received has definitely addressed my hair loss; the results are quite extraordinary. I had previously gone to a dermatologist who was completely unprofessional and didn’t explain anything to me! Just had a quick look over my hair and gave me Minoxidil. I was a little apprehensive to use it and wanted a second opinion. I found Absolique and they were professional and friendly right from when I walked in the door. I was surprised at the level of information I received. It was a relief to know that 1. There was an alternative to Minoxidil and 2. That I didn’t even need to take it. New routine working for me and pleased with results so far. Very informative and interesting, very happy with treatment. A helpful and informative session and routine. I feel very informed and positive about steps forward. Very interesting consultation and informative. Very informative and encouraging consultation. Carolyn is great! Carolyn, I would not have thought that improving my hair growth was possible at my age 8 months ago. I was very depressed when I first visited you because as far as the medical practitioners were concerned medically there was nothing wrong and I was told that hair thinning was normal at my age. I feel extremely grateful for the program you have developed and the knowledge that you are sharing via your business here in Brisbane. My confidence has vastly improved in both my private and professional life. Thank you for helping to restore the hair that I was born with. My hair is starting to thicken up as I have now done 7 Laser treatments. I went to the shops today, without a hat, for the first time. I just loved the feeling of freedom. That is what it is – freedom. No hat, no worry, no feeling of embarrassment. Thankyou Carolyn for giving me back my self-esteem. I have just finished my 8th session of laser treatment and am beginning to see some results. Each time I go in I am eager to watch for improvement. It is a slow process but well worth doing. The whole team are very informative and supportive. Proceeding with the Laser treatment and all is going well. I am more aware of the time it takes for my hair to grow but I have good vibes from Carolyn whom I trust. All going well at this stage. Nearly ready for another haircut. I am feeling positive about my hair and haven’t felt this way in years. After seeing my microscopic results side by side from month one to month 4, I am amazed at the progress. Carolyn has been so thorough and kind throughout the process and I am thrilled that I found her!!! 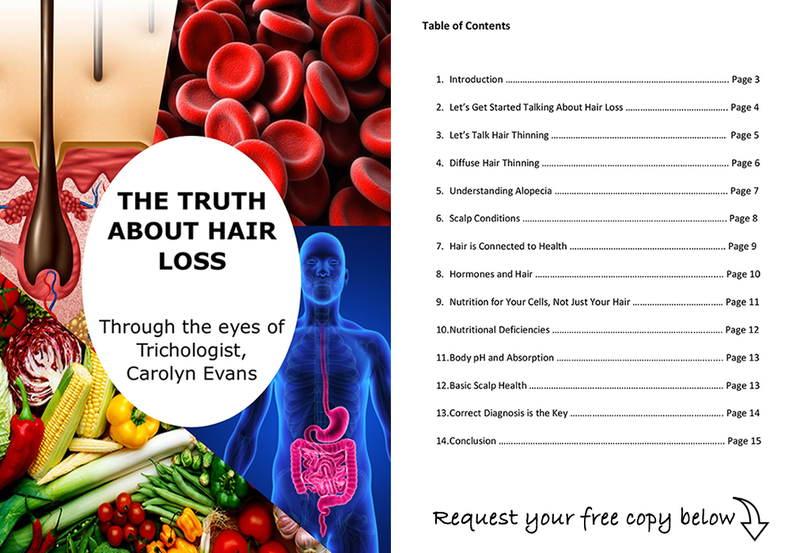 As a client from the USA, I have seen various doctors for years concerning hair thinning, and none have the knowledge and know how that Carolyn does. Hair loss is not permanent! I beleive this now. Yay Carolyn!! I have just completed my first four months of treatment and had my scope session. I am thrilled with the results so far and cannot thank Carolyn and her team enough for the support and advice offered during treatment. Friends and family have commented on how good my hair looks and I have a lot of new regrowth that was not there when I started. I have now moved onto the maintenance phase and am excited to see even more results in my next scope session in four month’s time. Once again I have realised how much circumstances affect my body. I had a reading done a couple of years ago and she said I have a life that has been and probably will be full of bad luck. Last August I was doing well and I was happy with my hair. Then September I fractured my hand. 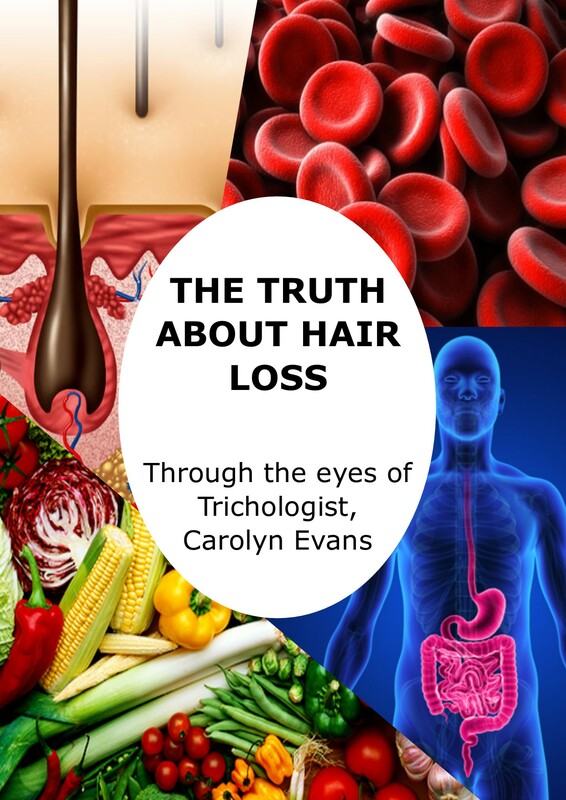 I didn’t realise until I came in for a Scope Test how much this inflammation would impact on my body,stress from work and there are a few other reasons I have gone backwards a little bit with my hair. I’m going to get back on track and hopefully in four months I will see a significant change and will be happy with my hair and me 🙂 Thanks Trace. Laser treatment number 6 coming up. Positive thinking is making me feel that it is working. I had a SHORT haircut last week and it looks better already. I know it will be great when it is all over but it is a slow process and I must be patient. Looking forward to my next 4 monthly visit when Caroline can tell me about the progress we have made. 4 month visit. We are making some progress. Starting laser treatment in a week or so. Looking forward to some more positive results in another 4 months. Patience is the key. Gives me hope about my hair J Very interesting information. Hi Carolyn, I was really impressed with your knowledge, empathy and understanding you gave us at our appointment recently when my son and I come in to your clinic. Thank you for the time you spent and all the valuable information you gave us. Very much appreciated. I had my first visit with Carolyn to find out if I can do anything about my fine thin hair and found her to be informative and easy to talk to. Carolyn sent me away with a list of costs and the treatment information I will need to get back on track. Now I have all the facts etc. I look forward to my second visit which will get me started on my suggested treatment plan. A lot of info to digest – thankyou. Half way through the treatment programme Persisting with the routine and remaining disciplined with the nutritional supplements. Finding the PHs quite difficult to shift. Constantly hovering around the 6.0 – 6.2 mark. Now visual results as yet. Remaining hopeful. As always great service and look forward to my next treatment. My pH has been better now that I’m starting to focus on it again. I slackened off the past couple of weeks getting into the same old routine. I’ve noticed again that it becomes extremely alkaline whenever I drink cider. This doesn’t make much sense at the moment because to me I’m drinking a processed (bad!) alcoholic (double bad!) drink. So I went back to doing some more experiments on my pH levels again. Such as cutting out dairy (which seems to make a small amount of difference, probably because I wasn’t having much dairy to begin with, only a sprinkle of Parmesan cheese or some milk in my tea). I also started cutting out bread (not carbs, just bread you buy at the bakery) – now this seemed to do a bit. Not that I was eating bread too often, about 1 or 2 times a week for a sandwich, but my body became happier when I eliminated it altogether. On another hand, I also found that my sleeping habits didn’t really affect my ph. Whether I get 9 or 5 hours sleep, it didn’t make much of a difference. So I can almost eliminate that. My stress levels and relaxation levels are the next to monitor. I took a weekend off and headed to the beach on the weekend and did absolutely no work whatsoever. Now I need to have a couple of stressful days of just hard-core work to see if that makes a difference. Oh and just as a sidenote, my diet is fairly balanced (well I think so anyway. It might not be!). I don’t drink any energy drinks whatsoever, literally just water and sometimes on the odd occasion cider or tea. Nothing else. My food still only consists of red and white meat (beans and eggs for protein as well as a substitute), plenty of veggies, fruit, sometimes carbs like rice in a stir fry or spaghetti Bolognese. If I don’t feel like a heavy pasta dish I’ll have 9 Grain Crackers with avo, tomato and Parmesan cheese on them. I try to be very controlled with any other foods such as freshly baked cakes or chocolate bars or ice cream, etc. So much so that I’ve made a deal with myself to force me to stay away off the junk food until Christmas (or some exception-type day like my birthday!). It helps me stay motivated in healthy eating. Plus I am also keeping it relatively ‘normal’ eating so that I can see what exact foods are affecting my pH! It makes it easier for my body to deal with. My exercise is average but I do exercise at least 3-4 times a week. Which brings me to my next query. What if some of the pills and lotions/sprays that I am taking for my hair treatment are alkaline themselves? Or maybe they could be acidic? For example when I wash my hair and do the needle brush therapy. Are those liquids alkaline or acidic? I suppose in the end, the body needs both to function properly. I took a blood test at the beginning of my treatment before I started, and I will take one when I finish to see if any of my levels changed. That will be interesting! I will keep you posted on it when I do! Nearing towards the end of my clinic treatments and must say I am looking forward to the final assessment and then moving forward on my own journey forward post re growth of hair!! It has all been worth it but looking forward to and hoping to be able to cut back on tablets and products. I’ve noticed a difference again this week. My hair is thicker and certainly the coverage over my scalp is better as well. It’s just two more weeks to go for the sessions so I’m very curious to see if all this hard work pays off! 1 more treatment to go in the clinic! Very excited and looking forward to the scope in another 6 weeks’ time!! Feeling really happy with the progress of my hair and there has definitely been a big change! It has been a success and a journey that has been so worthwhile. It’s nearing the end of my official 4 month treatment and I have seen good improvement with my hair. I am hoping I don’t have to take all of the health pills after I finish the cycle. But who knows. Fingers are crossed anyway! I am looking forward to getting the scope done and seeing just how my scalp is doing too. Hopefully my hair won’t go backwards. I definitely have plenty of questions for my last treatment! Had my second last session this week. I’m definitely seeing progress but I’m beginning to realise that I do have a long way to go. But better late than never I suppose! It’s only 1 month until I get my end of treatment scope done. I can’t wait to see what my hair and scalp feel and look like. I have noticed a difference which I’m happy with. it all comes down to time, doing the treatment and persistently taking the pills. Always a pleasure to get my weekly treatment done. See you soon! About to attend my last treatment later today – am quite relieved I’ve managed to get through the 12 weeks – am looking forward to the final scope session! Great team, awesome results! See you today! It has been 6 weeks since I first met with Carolyn and started treatment. The condition of my existing hair (which was very light and fly away) has improved a lot thanks to using Activance as well as doing the brush therapy and scalp cleanse. I have not yet seen any new thicker strands of hair growing but hopefully that will start to show in the next few weeks. The vitamin therapy is a bit of hard work but totally worth it if it means I’ll have healthy hair! I have decided to do the ‘in-salon’ treatment once a month to give myself a break and then do the rest at home. I must admit, the in-salon treatment is so much more enjoyable (the at-home weekly treatment is a bit stressful!) and the staff are both professional and friendly. So I had my last session in salon session. It’s been a real journey. I can’t wait to see what my results look like. People have noticed my hair and have said it looks really good now. It’s very exciting! I don’t know if anyone else finds this difficult.. but trying to work the 2nd lot of pills and green drink for the day into my diet can be a bit tricky! I think I’d always prefer chewing on a nice warm steak and salad for lunch instead of taking them.. but then I think of the progress I am making and choose the other option. The other meal will just have to wait until dinner. Isn’t it interesting how just doing this routine consumption of minerals and vitamins forces us to plan ahead more. Even if we take it into a bigger scope of things..planning when to take them if you’re having a dinner out with friends on Friday.. or if you don’t get home from work late at night and you have them at 9pm.. maybe you forgot to have them, or you chose that warm meal instead of them.. simple daily choices that are given to us or that we choose to take on can challenge us, just like committing to this routine can perhaps make our minds stronger in other areas.. “I will go to the gym before I take my pills” or “I will finish writing this article and then eat my lunch”.. little goals like that can make all the difference in productivity! Making our rewards for hard work all that much sweeter. …and so… I religiously take the 2 lots of pills to hopefully reach my desired outcome. Been better with the regime this week! The team got me back on track last visit and addressed my lack of resolve when deviating from a standard work day. Am still looking forward to only having to do treatment once a day though 🙂 Am going to try taking the green drink and pills with almonds tomorrow morning instead of breakfast. If this works and I don’t feel queasy I will continue the trend well past the end of my initial 4 month course. Will be much easier to do the treatments this way if the almonds help my body to avoid feeling ill doing the treatments, especially with nothing in my system after waking up. Coming up to treatment 6 I think? I’m starting to check my scalp now to see if any new growth is coming through.. there could be some hair follicles about to sprout as there are a few dark pinpoint spots on my scalp so am hoping these are new hairs, time will tell! I’m getting pretty excited…Karen could apparently see the some tiny hairs growing through…….it gives me motivation to continue with the regimen…..because it is time consuming…..but I’m beginning to see it worth it. This week’s been a bit up and down with the entire pill routine.. I’ve had what feels like a very busy week, and fitting the 2 lots of pills into that schedule has been hard! I still keep it up and don’t fall behind on any, it just feels like a lot more effort this week. I wonder if a busy schedule hinders the hair growing process? Maybe relaxing a bit more would help? I wonder if emotions change the pH? Well time flys when you are having fun…and success! Only 5 more visits left then time for my scope session, which I am very much looking forward to. Finding out last week from Carolyn in regards to food combinations and PH Levels has been very informative and hopefully can give me better results going forward. Again thank you Carolyn and your team for your continued support. It has made this journey so much easier. Last treatment appointment tomorrow – after this week it will be evaluation time! I am excited to see how much more healthy my hair will be 🙂 I am just as excited about having a clean scalp again to be honest; this scalp cleanser and brush therapy is honestly the best. Absolutely fantastic service. Going to miss you all when I’m away. This past week has been pretty average with my eating habits. I have not even tried to eat as alkaline as I can and my pH shows it, being between 5.5-6.0 on average. My sleep has been ok, and I missed one pill taking session on the 13th of Sept, which was a Saturday afternoon. The head and scalp treatment is going really well though, I keep that at a consistent 2-3 times a week when I wash my hair. I think I need to just restructure my diet a little and go back to eating more salads! My body’s probably crying out for it too.. so here’s to that extra 15 minutes in the kitchen. I think it’s now week 7 and I’m halfway. There’s definitely progress but I’m still impatient. I feel good about my hair even wore a hat and didn’t worry about hat hair! Seem to be at a bit of a plateau. 4 more visits to the clinic. PH has been very average and seems a never ending struggle to get it in the correct zone! But onwards and upwards and determined to get it right! One thing I can definitely say is that things are certainly better than what they were 2 months ago. Last week I missed one session of pills due to terrible eating habits and not feeling hungry enough to take them. This week has been much better.. I feel less hungry and am controlling my intake of food a little more and not going crazy. Sometimes that’s really hard to do, especially if something delicious is in front of me! My pH is getting back up to its normal reading of 6.4. I feel that my hair is starting to really strengthen, thicken and grow. There’s definitely a difference when I look at it and brush through it. I’m about half way through my 4 month treatment so hopefully my hair doubles its success rate again by then. I think I’m going to be happy with my hair at the end of this. The hard part is keeping up the looking after it part and making sure I keep up healthy habits like eating and exercising and treatment, etc. Onwards and upwards! I had had an itchy scalp and sometimes also on the nape of my neck for about 2 years. I had been to several doctors who said it was seborrheic determitis and had prescribed products all containing steroids which didn’t help. In June my hairdresser told me about tricologists which I’d never heard of. So after some internet research I found Carolyn and her clinic and saw her early July. After an examination she said it wasn’t dermatitis at all , just flake and was relatively easy to fix. So I started using her Scalp Cleanser and Activance and it all cleared up within a couple of weeks. I am so grateful to Carolyn and would recommend her to anyone else with scalp problems. I’m pretty sure it’s my 10th treatment later today. I don’t have anything to report yet but fingers crossed that these last 10 weeks of following this programme will reveal some results, fingers crossed. Only 2 more clinic appointments to attend and then that is my 3 month mark. Have really noticed an amazing change in my hair and are so glad I was able to commit to Absolique to help me on my journey. I would have no hesitation in recommending this to anyone and have the proof on my head to prove it works! Thank you to Karren, who is a breath of fresh air to catch up with every week, and the remainder of the team who are always happy, helpful and supportive. My ph was all over the place…. I guess it’s a good think I’m taking the green drink, which isn’t so bad. Am noticing more and more improvement which is really good. Only 2 more weeks to go….. People are also beginning to notice which is really nice. Good Morning Ladies, Karren looked after me last week and I was very happy with her professional approach to my treatment. She did a very good job. Great to know the girls are capable of a laugh, came into clinic with a wig on saying how impressed I was with my treatment so far. Mental note to self, tilt head back properly in shower to avoid tonic going in eyes. Also wear glasses during application of re-Stim, as I missed the bottle and tipped half of it out! Oopps. Great team at Absolique, look forward to in clinic next week, thank you ladies. I have just completed the first week of my journey. In regard to my wellbeing I do feel better from taking the drink and tablets. I had previously had the flu for 10 days and feel these have boosted my immune system immensely and helped me recover a lot faster than usual. If this is one week I am very excited about the coming months. Thanks again to Carolyn and her team for their help, support and encouragement. I am in my second week of the re-growing hair program with Absolique and the one thing that is getting slightly better is the routine of it all. There are still a few forgetful moments, like brushing my scalp, but I’m getting there. The natural pill supplements are easier to take some days than others, but either way, they’re still being taken, so I don’t miss out on taking those. And apparently only 4 weeks until I can start to see visual progress on my head, so until then. Keep going. Back on the (acid) buffer after a long spell. Ran out of product and then kind of forgot about that step! Everything else going to plan. Have started the new Prostate formulation too. First consult with Carolyn last Friday and it was promising to hear that my hair issues are reversible. Looking forward to getting started and seeing some results in due course. So far, I’ve had my programme induction and one treatment, due for my second treatment today. I’m getting used to the homecare routine – it takes me about 45minutes to do if I’m organised and have everything ready, so it’s not too bad really. The green drink isn’t too bad; I’m finding it easier to drink it in 3 mouthfuls and get it down quickly. Very early days so nothing to exciting to report but we’ll see how it all goes! So very sorry to hear that Lena is leaving the salon but wish her all the very best in her new endeavour. I’m sure her replacement will be fine as all the girls are very well trained. Barrel of laughs along with fabulous service. Wonderful team and I look forward to my next treatment. Almost lost the lid to my Tonique down the drain but lightning fast reflexes and grabbed it the nick of time! Week 4 and there’s not much just yet to report. However I am enjoying going to the salon and getting the in store treatment done. The girls there are quite good and sensitive to the whole hair issue which is important to me. There’s a lot of stigma attached to not having hair. I am now just beginning the 3rd week of my treatment. I am really happy with the changes to date and my PH now has a steady 7.0 which I am quite astonished by in such a short time. I am very glad I went with the option of weekly visits to the clinic as it is great to have the guidance, monitoring and all my questions answered on a weekly basis. My sincere thanks again to the team. 3 weeks in and there’s not really too much to report. The routine of it all continues to get better. The pills still don’t taste any better. My pH is still consistent, but I’m going to play around with what I eat this week and see what makes a difference. This could be interesting. Having my 3rd treatment later today – enjoying the downtime during the treatments. Have started noticing I have a bit more energy; hopefully from the supplements. It can be a bit of a pain taking the supplements day and night but have gotten into a routine now. My last appointment is on Tuesday next when I receive the results from my scope session. The results from my treatment has been amazing and I couldn’t be happier, and I look forward to further improvement as the weeks go by. A few months ago I couldn’t have imagined the improvement in my hair. Carolyn I just can’t thank you enough you are amazing. Lena thank you for my enjoyable weekly sessions, I will miss seeing you every week. Thank you all. Week number 4 of my treatment. Has been hard last week to keep my PH in the correct zone! Otherwise all is going well. My hair is feeling good and is definitely in a lot better condition. Hopefully it is doing what it should below the surface!! As always looking forward to my Friday Clinic session. Ok, another week down (treatment 4 tomorrow) and I am definitely noticing I have more energy and feel sharper and less foggy since taking the supplements. No change to my hair yet but the burning sensation I usually get from time to time seems to have stopped which is promising. Excited to see visible new hair growth. Yay, thanks ladies for the wonderful efforts to date. I look forward to future results. Good Morning Ladies, after talking with Lena last visit I re-read my Easy pH booklet. Well worth the read again because I had forgotten much of what was in the book and it is very informative. I haven’t noticed any difference with my hair, however realistically I don’t think new hair is going to visibly sprout out in just 4-5 weeks. Patience, patience. Need to up my game with stress reduction, improve emotional food binges and hope to see better pH results in future. Amazing how everything effects our body. Roll on 7.35-7.45 pH, you can do it! Wonderful team at Absolique, always look forward to my weekly in clinic treatment. We’re still seeing some progress, though I haven’t seen any new hairs yet, but certainly things have stopped falling as much which is a relief. Little things like photos and selfies look better and I’m beginning to feel more confident…..am getting impatient slightly but I know these things take time and I need to keep at it…this is a lot easier than said when you’ve been unwell! My 5th week in and not too much to update on really. Still finding it hard to keep my PH levels up, but otherwise still keeping with the programme and weekly visits to the clinic. Hoping everything is doing what it should and the truth will be told when I have my scope session at the end!! Good Morning Ladies, I realise how important it is to make sure the roller is free of hair for maximum function. Another week of treatments – it’s getting to be ok now and even the green drink isn’t so vile! I’m finding that there are other benefits to all the vitamins I’m taking including better nails and skin. My hair does feel better as well! Another fabulous in clinic treatment. Obvious new hair growth. Look forward to next session. My final treatment is coming up & it’s come to the end of my salon treatment. Looking forward to seeing results with Carolyn at the final assessment. Into my 4th week and cannot seem to get my Ph anywhere near 7, even with religiously applying acid buffer. Will try slightly longer sleep cycles, but wondering if the time we eat dinner can affect the result? Still battling to get more than one really green alkaline reading each week, but all is well! When Lena was doing the brush therapy, she said that she could feel and see lots of new hair growth. Very happy!! I always enjoy my appointments and hallelujah there was more of Carolyn’s miracle conditioner this made me very happy! I received so many compliments on my shiny hair. I believe I have been following the treatment for a month now, I notice my hair more thicker and my barber even complemented on my hair. I have only two more sessions left before my scope session. I am very happy with my results so far, my hair is much thicker and it’s looking healthier. I’m so glad I found Absolique Hair Health Clinic, as it has made such a difference to my life and self-esteem. Thank you Carolyn, Lena and girls. Good Morning Ladies, Well I went to my hairdresser on Friday and even she was excited about my new hair growth. She was asking lots of questions about the treatment so she can spread the word to her other ‘needy’ clients. The slightly darker colour seems to accentuate my scalp a bit though. Friendly service and got a referral to a great hairdresser. I have lil hairs growing here & there not sure if they will last & stay strong and grow longer and past the breaking point I usually have. My crown still feels very weak & fine and in general we’ll wait and see. The customer service at Absolique is 5 stars. They never forget the simple things you like when your there for your treatment. And very friendly and don’t make you feel uncomfortable. I have now completed my weekly appointments and I’m very very happy with the results. I could not have believed how much my hair has improved in this short time, to me it is incredible. My scope session is coming up shortly and I’m very anxious to see the comparison. Thank you Carolyn, Lena and girls from the bottom of my heart I am so grateful. I am now up to my last appointment prior to my scope session. My hair is looking and feeling so good, and I have my self-esteem back again I am so very happy with the results. Carolyn is so knowledgeable and an expert in her field. Many thanks Carolyn, Lena and girls, I have thoroughly enjoyed each and every visit. I have been taking my ‘pills and potions’ for about 9 weeks now but I sincerely hope that the green drink doesn’t play a huge roll in the grand plan for my hair. It is the one thing that I have trouble with and doubt that I will continue with long-term. After all this time….. YUK! It’s only week 2 and I’m already becoming impatient with my hair! Still I know that I need to stick at it and I’m hoping I get really good results. My scope session last week showed how much damage there was and I find that quite confronting. Let’s see how the next few weeks progress! Hi, my name is Robin and I’ve just started a 4 month program with Absolique Hair Health Clinic to restructure and re-grow hair at the top of my head. It’s been quite fine for some time and there hasn’t been a lot of it since I was in high school.. so I thought I’d research a bit more about it and find out what I could do about it. I read many pages on the internet about getting laser/implants for my hair and eventually I came across Absolique. They didn’t do a laser treatment.. I was intrigued, so I read more about them and eventually gave them a visit. During the initial consultation we discussed my situation, what we could do about it, and what Absolique offers. Their results seemed legitimate so now I’m doing their 4 month plan to grow more hair. I’m only 1 week into it so we’ll see how the program goes. I can tell you now though, that altogether the ‘medication’ (minerals and antioxidant tablets) I have to take for the program does not taste like chocolate cake.. but the women in charge assure me it will give me good results. Getting used to consuming them often and consistently, as well as now having a new ‘how to wash your hair in the shower’ routine is a bit of a challenge, but with time it will (hopefully) become easier. This week will be especially tough; have a work conference so will be ducking up to my room during breaks for the glorious green drink and supplements lol. Not quite at the halfway point yet – can’t wait until September / October so that we can start seeing initial extra growth results! Had first in clinic last week. Informative assistants. Now adapting to home treatment and taking that spectacular tasting green drink! My hair is feeling a bit dead at the ends but think it’s due for a trim. Can’t believe I’m at the end of my treatment. So glad my hair is growing. Hi guys, Not so much feedback but a bit of progress check. Been battling to shake the flu this week and have had to go on antibiotics. It’s been a doozie! Little hairs are starting to come back. And my hair is 10 times thicker than it was. I had my final in clinic treatment and am just blown away at my results. I can’t believe, how much new growth I have and am definitely looking forward to the final results. The green drink isn’t getting any easier 🙁 but my hair is feeling a little fuller, now I just can’t wait for it to fill in a bit more in the front. Okay week twelve. I have had a few comments this week that my hair looks really good. I have noticed up the top of my hair where it has grown thicker my curls are tighter and my hair is definitely a lot stronger now. Going for a haircut today so hopefully my hairdresser will see a difference in my hair. I’m tempted to get my hair cut shorter so my hair will look thicker but I’ll look like a poodle head lol so I just need to be patient. It’s going to be strange not going into the clinic for the next few weeks. I’ve gotten a bit use to my pampering and chats. I have learnt a lot about myself over the past couple of months, always good to keep learning and to keep improving oneself. Now to count down the weeks to find out how successful the treatment has been and where to now 🙂 Thanks. Hi, I would like to appreciate the hospitality of your clinic. Customer service is good and I always enjoyed the time I spent in your clinic from past 2 months. I am now at least half way through my treatment program and already seeing results, my hair certainly looks and feels much better. Once again a colleague and friend who has just returned from holidays has commented on the new growth around my hair line and the thickness of my hair, I was able to let her feel my hair without cringing as I would usually do. I am due to go to my hairdresser today for a trim and colour, and as it is a month since my last appointment I will be interested in her comments. I am so pleased with the results and my confidence is returning, I am so looking forward to seeing the full results after completing my treatment. Thank you Carolyn and girls. Thanks team for the research you did in support of Danielle. I had my 9th treatment at Absolique last Friday. Had a good time and best treatment ever. 3 more weeks to go to see the results. I’m excited to see the results in microscope. I love the red light therapy, it’s so relaxing. Can’t believe I’m nearly half way through!! Good morning my hair angels. Scope and comparison sessions completed with Carolyn. Overall a pretty good effort for 4 months of intense work. My hair strands are definitely thicker and strengthening and there is some good growth in the front, but there is still a lot more work to do in the top and back area, as well as strengthen the new growth. Whilst I would have liked to have seen more improvement, the fact that I have any at all certainly outweighs my impatience! Looking forward to the maintenance mode for the next 6 months and then follow up scope and comparison. I had my first in clinic session this week. Again very informative as I was talked through each process. The scalp needling wasn’t half as scary as I thought it was going to be. Slowly getting use to the home supplements and hair treatment. Hopefully I won’t have to think twice about it and it just become a part of my normal routine. And the green drink isn’t anywhere near as bad as I thought it would be! I am almost half way through my treatment course and feel very pleased with the results so far, my hair is shiny and healthy and I have noticed the curl is starting to replace the frizz. I continue to receive positive comments from colleagues some who have no idea I’m having treatment. I look forward to my weekly appointments, Lena is wonderful and very knowledgeable and makes every appointment very relaxing. I appreciate the professionalism and privacy afforded to me at each visit, therefore there is no embarrassment or reluctance to present to my appointments. Thank you Carolyn, Lena and girls. Hi guys, bit of dandruff…any tips? See you next week. I feel like there’s new hair growing. I hope it continues to grow & doesn’t break. I look forward to it growing more & more. This week I saw lot of new hair coming up on my scalp. I have 2 more treatments to go. My hair is now I think stronger than before looking forward for the microscope session to confirm. In clinic sessions are going well. Still getting use to some of the at home program requirements. It does get easier but requires commitment! Probably struggling mostly with the Activance as it make my roots curly every morning and night that I use it requiring re-straightening. Clearly I’m not starting to love my curls yet! It has been 11 weeks and I am feeling healthier and enjoying the positive changes in my hair, skin and nails. Recently told a friend about my last 11 weeks and she is looking forward to getting the hair she wants! Really impressed, that it’s about getting to the cause of the issue and not just trying to band aid an issue. It’s about prevention not cure. Only negative is the parking, hate paying $48.00 for under two hours. My first session was very stressful and emotional but I’m so glad I made that call to Absolique Hair Health Clinic. Every session has been positive, which I look forward to every week, and I am happy with the progress so far. Thanks to Lena for all her advice and positiveness she gives me throughout my treatment sessions. Thanks Carolyn for confirming details of the new prostate product. Added the Green Qi and pills to my topical regime on Friday night. Instant increase in pH levels, will see if I can get to the big 7! Scope results tomorrow. I’m feeling confident. Fingers crossed. It will be my last session this week and feeling a bit sad as visiting each week had become part of my routine! I am so happy I decided to make the decision to visit the team for 3 months and a very impressed with the results, service and knowledge I have gained. Carolyn was very honest at the first meeting about what the issue was, recommended process and likely results – honestly the results she predicted sounded too good for such a short amount of time (after worrying about my hair for years!) but she was right and I’m so glad I was wrong! I have my hair which I missed, definitely fuller head of hair, hairline is changed and my hair texture is back to what I remember. Sounds vain to be so worried about ones hair but when it is such an important part of your image/personality I’m so glad I didn’t just accept the changes as permanent and kept looking for the solution – which u found! Thank you to absolique! One very happy customer. My hair looks and feels great, but I’m still concerned about the sides, it’s certainly like watching grass grow but much slower. I discuses my concerns with Lena at my last appointment and once again her knowledge, professionalism and compassion allayed my concerns. I resisted the earlier option of using x fusion but now thankful that Lena presented this suggestion yet again. I have commenced using the x fusion and I’m ecstatic with the results and look forward to the day when I no longer need to rely on it. I have now had 5 in-clinic treatments and each time I have a session I learn something new about my hair and the treatment. The knowledge imparted by the therapist is very valuable and worthwhile. I know some people may not be able to attend the clinic weekly but I highly recommend it as opposed to doing it yourself at home. My husband is so impressed by my thicker hair that he has signed up to the program! He is on week 1 whilst I only have 1 week to go of the 12 week program. It’s been 6 weeks now, still getting used to the weird taste of green drink. I haven’t seen too much difference yet. I think it will take few more weeks to see the big difference…looking forward to see that soon. I had my last session with Kate, she has looked after me from the beginning so it’s sad that she is leaving. My session was good, I had bad dandruff as a result if my psoriasis in my scalp flaring up. It’s still itchy & tingling but I can’t seem to pinpoint the issue in my diet since taking the GF & DF commitment. Looking forward to my next appointment. Feeling positive and no more stressing when it comes to my hair. I look forward to my appointments in clinic because it’s a whole hour just spent on my hair and I leave feeling great with one step closer to getting my hair back. Thank you girls. It is now 6 weeks in and my hair is much softer with many baby hairs now visible. I am so excited to see what changes are awaiting in the next 6 weeks. Now that I have completed my course of weekly appointments at Absolique, my improvement showed that I no longer needed such frequent weekly appointments and I was also able to cut down on the amount of supplements I was taking. The ladies at Absolique have been so supportive and encouraging as I continue to make progress in improving my hair health therefore I decided to attend the clinic once a month to ensure I was correctly maintaining and constantly improving throughout my routine. The staff have been more than accommodating in this respect and for that I am very grateful. I look forward to viewing even more change in my hair growth and taking small steps towards maintaining my health outside of the clinic. Got my new stock from Neways, stocked up this time with a couple of Green IQ so won’t run for a while. It’s been a great experience so far with Absolique. Thanks to Lena for all the advices you are giving during every treatment. Last session left! Even though my hair is not as thick as I wanted… I’ve been told it’s like watching grass grow. However, my hair is not breaking as much as it was before so I am hopeful that if I continue to treat my hair like I was taught then slowly it will get to that point. Over half way now, lots of new hairs and the front of my hairline has hair again, no more scalp visibility. Absolutely love Activance for my hair. Acts as a great leave in condition and helps hair growth! I always enjoy my appointment with Sarah and Colette not only did my hair feel and look amazing we have a lot of laughs too! THE DREAM TEAM! I’m so very happy, with my results after 3 months. I have a whole new head of hair, would definitely suggest Absolique to anyone with hair thinning challenges. Okay week ten, time has gone by quite quickly. Looking forward to when my hair grows long enough and I will have a thick pony tail when I go to the gym, that hasn’t happened for many years. Thanks to Lena we worked out my pre & post workout powders have been stopping my body absorbing all of my nutrients and minerals because of the artificial sweetener and the soy products used. Not happy but now I know why the hair tonic and other vitamins I was taking wasn’t working. I have been on this protein powder for nearly two years. A bit disappointed in the health shop not picking up on this after I told them I have arthritis as well which makes my body very acidic to start with. Also explains why my pH levels are always crap. So now have a pea protein powder which is high in alkaline. Hope my pH levels improve and the absorption of all the vitamins, greens & the liquid minerals I’m presently taking for the treatment. Shame we didn’t work it out sooner but let’s hope I get a better result after the next month. So anyone who is on the program and is using protein powder please look at the ingredients as you maybe jeopardising your treatment. Thanks Lena for all your help and as always for your patience with me. An encouraging seventh session with Absolique this week. I finally confirmed with one of the girls that my hair has gotten a lot healthier. There are also some new hair coming in but it will take longer for them to grow long and make my hair look thicker. I had my fourth in clinic treatment this week. I’m still freaking out about washing my hair. I think my hair is looking a bit stronger and no as much hair loss when I wash it. I have the hair washing down pat now so happy about that as I was thinking it was a long process. As always I’ll end on a positive and as I keep saying I can’t wait until I have hair like my beautiful daughters. No change in my hair, still looks and feels great, but it’s like watching grass grow – only slower… Using X Fusion for interim coverage has been fantastic, I don’t think I would have coped without it. Each week the area of coverage required is getting less and less. I look forward to the day that I no longer need to rely on it. My pH is finally returning to normal, it seems a lot more stable than last week although not completely one hundred percent just yet. The new growth around my hairline though is phenomenal!! The hair that is growing in is thick and dark and will hopefully grow to a long terminal length, I can’t wait! So sad that I only have three more sessions with the lovely team left. I had my third in clinic treatment this week. The girls are absolutely lovely & put you at ease straight away. It has been years since I have brushed my hair but I must admit it I am enjoying the laser hair brushing. I’m still freaking out about washing my hair. I’m counting down the days until my hair is going to start looming thicker. I’m still getting down about it & looking at other women’s hair & getting jealous. I will keep moving forward & will do everything I can do for the best results. On a positive and as I keep saying I can’t wait until I have hair like my beautiful daughters. One thing that really makes you feel welcomed at Absolique is the relaxing environment and the friendly staff. My sixth session at Absolique was another great experience. I am halfway through! As I’m entering week 8 of the program I can definitely see the rewards of my efforts with quite a lot of new hair growth. It is really encouraging, rewarding and exciting. I feel so good and so many new hairs are popping up everywhere, it’s unbelievable. This is really better than I could ever have expected. So happy with the results and I haven’t even finished yet. I am always so grateful to the team at Absolique for giving me fantastic service and advice. Thank you. I had my first in clinic session and it was interesting. The brain freeze procedure and the micro needle were perhaps the strangest techniques but if it means better hair than I don’t mind. I’ve found that I need to buy 1 of the tablets on my next visit as they only last 2 weeks in total. Taking the tablets & oral dosages has been a challenge. I had my 4th treatment last week by Lena and I truly appreciate her for the way of giving service and the quality treatment. I am looking forward to see good result in the coming weeks. It’s now week seven I can see a slight change in my hair and friends have made comments it looks thicker at the top. I still have the patchy area on the side of my head but understand it is because of new hair growth but doesn’t stop me from freaking out and again I’m a drama queen lol. My youngest daughter made a comment and said my hair looks thicker and she can’t see my bald patch at the back of my head so I’m taking that as a positive that my hair is thickening up and that the treatments are definitely working. I have to thank all the girls for listening to my ramblings when I come in for my in clinic treatments, they are very patient with me. Now onto week eight will I see more changes, we can only hope. I am now in my 3rd month of maintenance. The results are still exciting as my new hair is so much stronger and thicker. The curl I have now is so much stronger and requires less product to keep it looking good. So glad I kept going through the program. I’ve just finished the second week of the program. It’s getting easier as each day goes by, though the green drink is still gross. The best thing to do is put it in a water bottle or protein shaker so you can’t smell it! All the tablets that I take for hair growth etc. have helped to improve my skin. Got to love that!! Last week of the in clinic sessions, I have mixed feelings this week – I’m really excited that the next stop is my scope session, but also sad that I will miss the weekly mini pamper session with the girls. PH levels this last week have been like a roller coaster – I’m thinking a little stress, lack of sleep and allergies have contributed to this… Hoping this doesn’t impact my hair growth cycle too much but time will tell. After 1 week with Absolique I’m realising this is not just about hair but a journey in understanding general well-being. Getting to know what we need to eat to maintain optimal health. Also wow’ d by concept scalp cleansing. First time I tried this at home my hair has looked the best it has in years. Learning the how is the important part. For the first time I’ve started to see new hair. This is amazing! Very happy to see the first new hair growth. I’m still growing new hair and my hair feels healthier and looks fuller. Scalp sensitivity is still there, but manageable as per previous 2 weeks. Lena mentioned at my last in room session that the little tufts at the front seem to be getting a bit thicker. I really don’t want to get too excited so soon but there does seem to be some progress. I have just completed my 4th week of treatment and my overall health and well being is really great. My pH level is finally alkaline all thanks to the “green” drink! It was my third session with Absolique and as usual it was a relaxing experience. After a hard day at uni, I really enjoyed going there and talking to the girls. My hair has improved a lot in only 3 weeks and now I am confident that I am losing less and less hair every week. Along with a great service, I also received some free weight loss ideas! Once again it was my time of the month so my pH balance was off for most of the week but has been slowly coming back up to normal. My usual stylist Kate was still on holidays and so I had the lovely Lena take care of me. We had the best chat about study and travel and I felt so relaxed and well cared for. All of the staff at Absolique are so much more than hairdressers; they care for you as a person and are willing to share their own stories to help you on your journey. Love coming every week. So glad to have Lena back. She does the best brush therapy ever!! Really like our chats. At the end of my treatments now and am very much looking forward to the final scope sessions to see the results. One of the most enjoyable parts of the treatments is coming in to see the girls every week. What a wonderful team they are and I will miss seeing them all the time! Without fail every week, the girls are so friendly and fun and the service and attention I receive is amazing. I can see lots of new tiny hairs around my hairline!!! So excited for this, I can’t wait to see them thicken up! Unfortunately my pH has been really off this week and I *think* I’m shedding hairs again but will talk to the lovely girls tomorrow about it. So pleased about the new regrowth though. My fourth session with Absolique was as usual very relaxing. Now that I know what my body is lacking, I can talk to the girls to find out which supplements will be okay to take with the other vitamins and minerals I’m taking. This session just made me confident that Caroline really knows what she is doing and can really help. My hair loss has decreased significantly and now I’m just hoping that it starts to get thicker! Fingers crossed! Noticing a little less hair fall out this week, my usual weekly bathroom corner search of hair clumps has seen smaller results – can only be a good thing and I hope this also a positive sign towards healthier scalp and hair. I’m still loving my magic sprinkles, the only down side is the thin layer of dust it leaves in my bathroom (more cleaning, but a small price to pay). So much new growth coming through. I can see it and feel it now. I’m very excited to tell people, even though they are already noticing. Very happy. I am only a week into treatment, so it is hard to tell if anything is working yet, I’m finding the whole treatment program good though, nothing is hard about it, taking the supplements is easy, apart from the green Qi, but I will use the tips from the newsletter for that. The topical treatments are fine and I enjoyed my first in clinic treatment. I have to say all of the girls are lovely, friendly and very approachable and are more than happy to answer your questions. Carolyn replies to emails promptly and I am very happy with the client contact. I had my first in clinic treatment. I really enjoyed the laser hair brushing which is strange as I am so scared to touch my hair. I washed my hair last Friday but didn’t notice anything as I put it up in the morning to go to gym. Well I have washed my hair today and I am freaking out again as my hair is so thin. I know I am being impatient but I will be wearing my hair up for the next few weeks until my hair starts to thicken up. I am concerned at this point in time that I will not get the results others have been lucky to experience. I am venting about my situation and I am a little concerned but I have the guarantee that I will see results…so I am holding onto that and will move forward with the rest of my journey and just hope I will have beautiful hair like my daughters soon. My pH is still not on track and after monitoring my eating, exercise and sleep habits I still have absolutely no idea why. My hair is looking shiny and healthy though and there are a lot of new baby hairs popping up, especially around the hairline. I can’t wait to see Kate again this week. A comedy of errors this week, I forgot my micro needle at the in-salon session, missed 1 round of pills and green drink and on another night the acid buffer. Just when I thought I was getting used to my routine without having to think about it, a super busy week throws me into chaos. Hopefully not too much of an impact on the overall results. I am going to vent again this week as I can’t tell anyone else about my embarrassing problem. It seems silly people tell me they love my hair but they have no idea to the extent as to what my problem is & how much my hair is damaged from years gone by. Every time I wash my hair I still freak out. I washed my on Friday and woke up on Saturday with hair on my pillow..Omg I nearly cried..no hair since but I did freak out. I have a few personal things going on at the moment, trying my hardest not to stress but come on when am I going to get a break. All I asked for was a couple of months to hopefully get my hair sorted. To end on a positive and as I keep saying I can’t wait until I have hair like my beautiful daughters. Another great appointment with the dream team Sarah and Colette and YAY so happy there was a little bit of Carolyn’s super conditioner left my hair feels amazing! After nearly a year of treatment, my time is almost up. I will miss the girls at the clinic but am determined to have a regular check-up to make sure I stay on track. This week has been pretty uneventful and everything is continuing normally. I am starting to get a little sick of always having to remember to take my drinks and vitamins but they honestly make me feel so much better when I do have them – they give me energy and I feel more awake which is great for school! My usual assistant Kate was away last week so I am looking forward to seeing her again this appointment! But I was well looked after by Colette who is doing so well with her training and is lovely to chat to. As it came to the end of my journey for my weekly appointments at Absolique, I was looking forward to viewing my results via a scope session which detailed before and after pictures of my hair & scalp. As always, the staffs at Absolique were very supportive and gave very positive encouragement as well as pointing out areas where I can improve my results. After my appointment I walked away motivated to continue improving the health of my hair and assured that with the support of Absolique I will only see improvements. I feel the products going onto the scalp and hair does seem to give a thicker feel/appearance. Top of scalp a little tender after last night’s needling but that just means the products will go into the skin. I am beginning to notice a difference in my hair health and the volume of my hair is starting to change. The nutritional and ph testing have now become a habit. Last week I mentioned my scalp was a little sensitive, it still is this week but it’s not uncomfortable so I’ll be sticking with the micro needle routine. I was worried about not having highlights in my hair to try and mask the thinning areas, but since I’ve been using the magic sprinkles and going back to a colour that closer to my natural shade, I’ve been getting some great compliments. My only difficulty at the moment is trying to stick to only taking the green drink and pills when I’m hungry – easy on weekends, a bit harder to juggle during work hours. Just recently started the hair program at Absolique Hair Health Clinic and from all the independent research I how conducted regarding hair thinning, I was astonished by how much I still didn’t know. It’s really a full spectrum program as it tackles hair loss on many fronts as it addresses nutrition, topical solutions and other various tactics of stimulating the scalp. I’ll still in the infant stages of sighting any results but I’m confident they will come. My experiences at Absolique are always professional. Considerate and understanding. I highly recommend any one with hair problems to visit Carolyn for a consultation. Week 2 and I’m starting to settle into the routine of pills, green drinks and hair/scalp treatments. The only really unpleasant thing is the Green Drink, I don’t think I’ve ever tasted anything that bad before, that said it’s not a hard routine to get into and the team at Absolique have been great in answering any questions I had and the in-clinic session was just pure bliss. I’m feeling confident about my treatment and the future of my hair. The home care treatment is a lot easier than I thought it would be and the instructions provided make it very easy to look up how many tablets to take a day or where to use your micro-needle if you forget. The thing I’m probably finding hardest is waking up a little earlier to take my green qi so that it is digested on an empty stomach but luckily I don’t mind the taste unlike a lot of other people! Already my hair is looking fuller, especially after using Activance which is my favorite product hands down! Treatments still going well, with only three left to go. I am really looking forward to comparing the scope results. Visiting the salon is always a lovely and relaxing experience. I am impressed with the overall volume of my hair, it’s already quite long but the fullness of it seems to have really increased. Activance is truly an amazing product and I’m so glad that I now know about it! Week 4 and the routine is starting to feel like it’s just part of normal everyday life. It might be too early to see most results but my hair just feels fabulous and I’m amazed that I’ve been able to throw away all of my chemically laced products. I’m still guilty of a little hairspray but not as much as before. This is week three and I’m getting more confident with doing my in home treatment. After my last visit I was impressed with the changes in my hair health. To this day I am grateful that my daughter introduced me to Carolyn. Lost confidence is now back and my hair is the best it has been for years. My last week of the 4 month treatment, phew. It takes commitment to go on this hair health journey but I’m glad I made the effort. If only it was as easy as popping a magic pill once a day. Know much more about cause and effect, and now feel that I can address things that have bothered me for years. Hopefully the improvement I feel in my scalp and (I think) my hair strength will show up clearly in my before and after testing in the next week or so. Week 5, my scalp is starting to feel a little more sensitive to touch, I’m assuming this might be due to the micro needling – perhaps I’m getting used to it and applying a bit more pressure. pH levels are within good range and everything else seems fine. Getting close to the mid point mark and looking forward to seeing if there has been some movement. I am 4 weeks into treatment and while it’s a little early to see hair results I am seeing the results of taking the supplements…. feeling like I have a lot more energy. Looking forward to this weeks treatment! My “shed” has continued this week, although it has not been as stressful as the team’s support and explanation of the hair cycle have put my mind at ease and I am no longer counting every individual hair. I slept over at a friend’s unexpectedly this week and so I missed one round of green qi and vitamins – my first miss as I have been very consistent up until now. I don’t think it has affected me too majorly and I don’t plan on missing any more so it should be fine. I am excited for my appointment tomorrow! Only 3 more weeks left of my 4 month (hit it hard) treatment. I am looking forward to comparing the before and after results from the scope photos, and I’m hopeful of seeing the results before my eyes. My hair health took years to deteriorate, and I’m determined to do the right things to get back in balance, even if it takes a awhile. Hopefully I will be able to cut down on the treatments and continue an effective battle against the dreaded DHT. I’m about halfway through my treatment program and I am starting to notice my hair becoming thicker on the top of my head. Can’t wait for my hair to grow to fill out the rest. The team at Absolique are always so friendly and welcoming, and certainly know their business. I have had good results. Just before Christmas had my last session, then on to Whistler for a Ski holiday, packed what I felt was my weight in tablets, powder, shampoos, sprays and Tonique and off I went. As we were on a ski holiday, when you get up in the morning it’s a routine of grabbing something quickly and then hitting the slopes. Obviously this isn’t conducive to the hair routine as you need to take the tablets. I set my alarm every morning an hour earlier, took the tablets, stumbled back to bed and hoped id fall asleep. 9/10 times I didn’t but c’est la vie. It was difficult keeping up with everything on this holiday especially the tablets. And as you can imagine the last thing you want to do after a full day of skiing is the hair routine! That being said…over Christmas was when I first really started noticing the changes in my hair, when I go to spray the Activance instead of clear partings I now just have hair to spray, a lot more filled in. As I was saying to Kate, I feel like a Yeti. Also although my husband may not have been noticing, I have had so many comments from friends saying that my hair seems different and has more volume. Initially I didn’t tell anyone about what I was doing but now I can’t stop. As its working I want to shout it from the roof tops! The front is still my most troubled area but that was the worst hit so it stands to reason that will be the last one to recover. If it keeps going the way it is i will be the happiest person ever! The hair care is still going well, continuing to buy all the tablets and do the routines. I’m just waiting for my immediate hairline to kick in, it must come soon! I really look forward to my weekly treatments. The nutritionals I’m taking as part of the program have given me a lot more energy and I’m feeling healthier than I have felt in a long time. My hair and scalp are definitely looking and feeling a lot healthier as well and I feel like my hair is looking a lot fuller and richer as a result so far. Feeling good about the treatment. Can notice a little bit of improvement. Looking forward to my last 2 appointments. Entering the last month of my 4 month treatment. I find with the once weekly clinic treatments I am slowly but surely increasing my knowledge on cause of scalp and hair problems, no question is too tricky for the Absolique girls. I guess from an almost zero knowledge level when I started I had to improve. Forgot to brush my hair and scalp before scalp cleansing the other day and felt almost guilty. Went for a run to find a good excuse for doing the routine again, but properly this time. Determined to get the best results possible in this 4 month treatment. I’m halfway there! I had another lovely visit with Kate who I have pretty much had from the start. You can really tell the difference in my hair now; my hairline is almost joining in the middle completely. I’m very happy with how far I have come and I can’t believe I still have six more visits to go! The only thing I do find very trying is the drink. When it’s first thing in the morning and all you want to do is have a nice breakfast and you end up having to drink the feroxin and the green powder it doesn’t make you jump up and down with excitement that’s for sure. I’m going to keep going and keep staying positive though as I can clearly see the results now and Kate assures me it will get even better! Look forward to every visit I have as its one step closer to the end and everyone in there is so lovely! On the 7th week of my 4 months treatment and having gone this far, no turning back now. It’s becoming 2nd nature to give my scalp a vigorous brush treatment before I cleanse (replacing shampooing) my scalp and hair, and another benefit of this is I don’t have a hint of dandruff. I was able to schedule the in-house treatments at Absolique starting at 5pm which works perfectly as I can pop in after work. When I started my treatment with Carolyn and the girls, I never thought I would get used to all the steps I had to do for my hair care. Now months done the track, it is very routine and no hassle at all. It is now week 11 and the results have been great and exceeded what I thought would happen. Loads of new hair and stronger wave formation. Even my regular hairdresser was impressed with the results I have achieved. I have been disciplined with my supplements and routine so I am glad that I have persevered. I received the results of the scope session after a year on maintenance. Results were good but still room for improvement so I’ll be doing another year. On day six so a long way to go! Week Two: went to the clinic for my treatment, it’s so much nicer than doing it myself, plus they do so much more. Home care has had its ups and downs. Dropped the tonic in the shower and the little nozzle broke clean off…so don’t drop that thing! The hardest part I find is the parting of the hair for the treatments, I have what the girls have called mermaid hair (ie very long) and trying to separate my hair in the shower after the scalp wash is very hard. The whole treatment takes a good hour from the washing of the hair (and rest of shower and coordinating what to do first so that you can jump out as soon as possible!) to the roller (more parting) to the tonic…to drying my mermaid hair…to the restim +. Yes, it’s an ordeal..BUT if it works, it will be worth it. So green stuff…still tasting yuk, going to try the girls suggestion of jelly cubes instead of liquid version, must buy another batch for that. Cold water makes it a little easier though in the mean time. Flying through the tablets too…it’s going to be a pricy one I think! We will see what happens. Just finished my 2nd of 14 treatments with Absolique Hair Health Clinic. The staff are warm, friendly and make you feel relaxed. After having experienced hair loss and the stress that comes with it, it was a big step coming here to get some help. With such lovely staff the anxiety I felt about getting my problem fixed melted away. Hair is getting better each day. I feel good about the supplements and treatment. Looking forward to this week’s treatment with the very caring and wonderful people. Week three: I’m getting the hang of the roller of death, and if you drink the green stuff from a bottle or shaker (something which means you can’t smell it) it doesn’t make you gag…as much. I’m going on holidays for two weeks so I started counting out the tablets and what not that I will need. Looks like I will need a complete refill of EVERYTHING! The pills really don’t last long at all, I guess taking 14 a day will do that .Not looking forward to the next bill. On a positive side, I have my hair routine down to 30 mins, start to finish, was amazed when I checked the time. Might have something to do with the fact I cut my hair in the front so now parting it isn’t such sweet sorrow. Looking forward to seeing the girls. Best part of this whole thing, Lena and Kate are great fun. I had my scope session with Carolyn. It seems that I may have good results. I will know the exact outcome when I see the comparisons. Entering the 6th week of treatment, and I am getting value from the in-house treatments. Chatting with the Absolique girls (while the treatments are being administered) I am improving my knowledge and awareness of good nutrition which is vital for inner health and thus outer health, the hair and skin. Even touched on the subject of Nutritional Anthropology which I am sure you won’t hear from your local hairdresser. My overall health feels fine, and I have confidence that my medication is targeted at overall health which in turn is reflected in hair health. On to week four! Week Four: this will be my last visit until after Christmas, two weeks flying solo. All in all, the routine is down, the roller is down…and I think it’s just the lack of break that gets to you. I also feel like a massive failure if my ph is low, which due to Christmas parties and antibiotics mine has been! My hair does feel healthier and I will power through!! Looking forward to finishing the four months though! It really does take over your life! From the very beginning of my journey at Absolique Hair Health Clinic I looked forward to my appointments each week as every time I attended the clinic I would be reminded of the steps forward that I am taking to improve the health of my hair and seeing results in baby steps week by week. On those weeks where I perhaps hadn’t followed the home care routine as well as I should have or when I had become discouraged due to one reason or another the ladies at Absolique would be there to gently remind and encourage me of the steps forward that I have taken and get me back on track. Looking at where I have come, I know that I still have a way to go however am excited to see the end results in due time. Now on the 8th week of my 4 months treatment. “Signs of my old itchy greasy scalp condition” have disappeared, and it feels much improved. Previously after shampooing, an hour or so later my scalp would itch, but no more of that – thank heavens. I’m finding it satisfying to be proactive about my hair and overall health, and am staying motivated to make the effort that is required to improve those areas. Going well, but life keeps getting in the way so it is hard to remain motivated. Perhaps a pep-talk from Carolyn for those part-way through treatment would help some people. My hair felt absolutely amazing when I left the clinic and i’ve had heaps of compliments about how shiny it is. I’ve also had comments that my hair is growing so long and getting thicker….this is the best compliment EVER for me considering its been a long journey of hair loss. It’s great to be greeted with smiles and how has your week been, then offer of hot and cold drink. Kate’s got it sussed what we have without asking! And spend rest of time catching up like friends what we’ve all been up to during week. Well. I’ve completed my program. I’ve kept to the schedule – apart from a few missed days due to travel. I am happy with the result to most of my hair; however, I do not see any improvement in the front which is where I did desperately want to see change. Perhaps it will look different under the microscope and all I have to do is wait for it to grow. I hope so. My hair is looking amazing. I’m so pleased I went in to the salon. It will be interesting to see the before and after photos! Last treatment this week. This has been a very worthwhile exercise. The condition of my hair is great. The new growth in the recessions is amazing. I can feel that my hair is getting healthier. Hope it will soon come back to the same quantity & quality as it used to be earlier. It feels great to visit the clinic every week. They are really a nice people. Hair health can be an emotional roller coaster so I am always pleased that I have the team at Absolique to help get my hair back to its best. On the 4th week now, and have got the nightly routine of home treatments down to about 35 mins. I have dropped the daily vitamin tablet I used previously and replaced it with the daily medications as advised by Carolyn, and feel much more confident in the real benefits I am getting. I am doing the daily in-house treatments, and a tip to beginners, don’t forget to take along your micro needle. Previously I dreaded having my scalp touched (itchiness) even for a haircut, so with my scalp in much better condition, plus the friendly staff at Absolique, I am finding the in-house treatments not so scary. My fiancé and I can’t believe we’ve nearly finished all the hair appointments! When I started it seemed like such a long time! Its been a matter of priorities and we decided my hair came first for these few months and everything we could do just worked around these. Can’t wait to see what my hair growth has actually been. I’m going to miss coming in and having lovely friendly girls pamper my hair. The girls at the clinic were wonderful. So positive and friendly. Carolyn is lucky to have such a lovely team working with her. Well done girls. Last appointment for the year will be a scope session after 12 months of maintenance. Looking forward to seeing the comparisons. Good news hopefully!! I continue to see great improvement as each week passes and am very pleased. This is now my 7th week into the program and I am so pleased to say I am noticing new hair that is growing faster than ever before. My hair feels stronger and curlier closer to the scalp. I just can’t wait to see what it will be like in the coming months. Maintenance is going well. It’s pretty much part of my life. I’m still growing new hair. Started last Wednesday, the full package, so lots and lots of pills and work with my hair. It does take some time to get a plan in place hair wise. I realised after my first try with the roller that every day is too much and I found little dots of blood…not so good. So now, I’m going for roller every second day and of course looking forward to having that done for me expertly in the clinic. The worst thing I have found about the treatments so far is the drink prior to the tablets. By far that drink is the worst thing i have ever tasted. I have created a calendar with a countdown on it. The last day I have to drink that stuff can’t come soon enough! That aside, the scalp cleaner is amazing my husband made the comment that my hair has become very big (before styling) made me laugh and pretty happy. Really hope this works! On day six so a long way to go! Nearly half way! It is nice to have your own girl. It is more personalized; Sarah feels more like a friend than getting paid to do her job. At my clinic visit his week the assistant showed me the new growth on my crown. We were both excited to see how much had re grown. I always enjoy getting my hair done by Sarah and having our funny chats, I look forward to it every 6 weeks! I also hear the new ad on B105 every morning congratulations it’s great! Nearing the end of my maintenance cycle. I feel like my hair has definitely thickened. Scope session soon so all will be revealed!! The team at Absolique have the best product knowledge around regarding hair health. I always leave feeling like I have been given the best personalized treatment for my hair. Yeah half way!! Can’t wait to see hair growth! My fiancé has been very supportive the whole way through. He’s gone to every appointment with me! Every time the girls have made him feel welcome and include him in everything, including always offering drinks. Thanks! Looking forward to my next session. I value the reassurance that my hair is responding to all the treatment. I can’t wait for the next few weeks to see this new growth gaining length. I’m happy to say that the quality of my hair is greatly improved. Must be all the Neways I’m taking too. Will be taking Green Chi forever. It’s such a nutritious drink. This week I’ve noticed that my hair is very silky and shiny. Feeling so positive about my hair now. ONE WEEK TO GO!!!! Getting excited to see the results through the microscope! Common all that hard work!!! All treatment completed now. I look forward to my scope session to see how far I’ve come. Carolyn was as always very positive and helpful. Last week I started my treatment with Lena. She is very friendly and enthusiastic about hair.The team at Absolique show a genuine concern for hair health. The service received was excellent. Can’t wait for my hair to start growing! I have just finished the last of the treatment program. The results so far for me have seen my scalp health vastly improve. I no longer suffer from scalp irritations or inflammation. My hair fallout has reduced considerably from prior to starting the program. As for hair re growth I await the scope session, I have not seen hair restoration of my hairline but have noticed a generally fuller appearance of my hair on top of my scalp. As usual the service at Absolique has been excellent and I shall miss my weekly sessions with the team. I am finally getting used to having the Green Qi drink, actually enjoying it now. Feeling really good! I started a course of treatment at Absolique because I had a lot of hair loss and the condition of my hair was wispy, fine and lifeless. Now after my treatment it is in wonderful condition and the re growth is amazing. Many thanks to Carolyn and her staff. Very friendly and helpful, from first point of contact on phone to visiting once a week. Can’t wait for my hair to start growing! My hair and head feels great after washing it and going through the special process and isn’t so greasy and even looks thicker. I’m still doing my monthly maintenance sessions and I must admit I look forward to it. I particularly look forward to the reassurance that my treatment is on track. My recent visit was once again filled with positivity and exceptional service. Lena and Sarah are a fantastic team who always provide me with exactly what I need to feel great. Thank you!